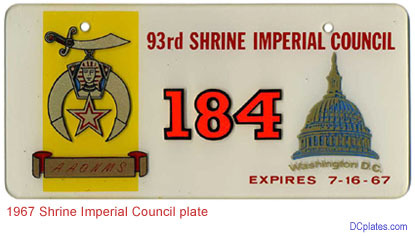 Although a number of Shrine Conventions and Conferences have been held in Washington, D.C. over the years, special event plates are known to have been issued only for five of them: 1935, 1958, 1961, 1965, and 1967. These plates were valid only for the few days of the actual convention or conference. In most cases the number of plates made and used is unknown, although numbers on plates held by collectors today suggest that no more than a few hundred of each were produced. This flat aluminum plate is an example of the kind used on miniature cars operated by Shriners in parades. These plates are not issued by the D.C. government and are not used for registration purposes, even temporarily. Each of these Shrine convention badges have wonderful D.C. motifs. Above An undated badge with a central image of the U.S. Capitol. Above Right A 1923 A.A.O.N.M.S. National Convention badge naming the Almas Temple, the local chapter of the organization. Right An A.A.O.N.M.S. National Convention Badge from 1935, the first year that special plates were issued to commemorate the event. The dates of the convention, June 11-13, are included near the top. In 1870, several members of the Fraternal Order of Freemasons that met on a regular basis in New York discussed the concept of forming a new fraternity for Masons where fun and fellowship would be the hallmark of the organization. One of the founding members, William Florence, was an actor who performed in many European and Middle Eastern countries. At various cities, including Cairo and Algiers, Mr. Florence attended private parties that featured elaborately staged musical comedy shows that concluded with guests of the show becoming members of a “secret society.” Mr. Florence was so impressed with what he had seen that he decided to use it as a format for the new Mason fraternity. With the help of his friend Dr. Walter Fleming, another member of the Fraternal Order of Freemasons, the ideas supplied by Mr. Florence were converted into what is now known as the Ancient Arabic Order of the Nobles of the Mystic Shrine (A.A.O.N.M.S.). 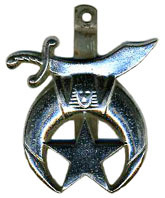 In order to become a Shriner, a man must first be a member of the Fraternal Order of Freemasons, the oldest, largest, and most widely known fraternity in the world. Today there are approximately 500,000 Shriners, primarily in the United States. When asked “what is a Shriner?” many people think of the clowns and funny little cars that appear in countless parades around the country. Others may recall that Shriners have very large conventions and wear a fez, an odd-looking red hat with a black tassel. While all of these points are correct, the most important activity of the Shriners is their 22 Shriner Hospitals for Children that they operate around the United States. Since the first Shriners hospital opened in 1972, more than 700,000 children have been cured or substantially helped at no cost to the child or parents. The hospitals focus on treating orthopedic, burn, and spinal cord injuries. This page was prepared by Charlie Gauthier, a native of the District of Columbia who lives in Northern Virginia. Plates and other items pictured on this page are from Mr. Gauthier's collection, and DCplates.com is sincerely grateful for his contributions to the site. For additional information about Washington, D.C. Shrine special event plates or to provide more information about or images of them, send an e-mail to Charlie@DCplates.net.